This month’s post has been written by Sophie Chavarria, a second-year PhD student in Classics and Archaeology at the University of Kent. This article is partly inspired by a talk she gave last month at the Annual Meeting of Postgraduate in Ancient History organised by the University of London. Sacrifice was a fundamental religious procedure in the ancient world as it was a favoured mean of communication between humans and gods. It was a complex but central act of religion. The expressions rem divinam facere, ‘to make a thing sacred’, facere as ‘to sacrifice’ and sacrum facere, ‘to perform a religious ceremony’, show the importance of this act. Sacrifices established a hierarchy between the gods, the humans and the animals as these divine beings were sharing an animal victim, (or vegetable-offering) with humans. However, historians have traditionally refused to see Roman women as involved in sacrifices, considering these rituals as conducted by an exclusively male category (Scheid 1993, 57). 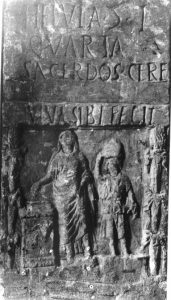 Regardless of this interpretation, this blog post confronts those supporting the theory of so-called ‘female sacrificial incapacity’ by showing how women were fully endorsed to perform sacrifices on behalf of the Roman people (de Cazanove 1987). Figure 1: Intaglio depicting a sacrifice performed by a priestess near a statuette of Apollo. Rome, Capitoline Museums. © Photo: Giovanni Dagli Orti. Sacrifices formed the main component of the worship of the ancient Romans. They were signs of gratitude, employed in order to appease the gods or to obtain their favours. Conventionally, sacrifices ended with a banquet where the offerings or meats of the victim were shared, and the privilege to attend it (or not) represented social hierarchy. Scholars have assumed women were prohibited from participation in sacrifices based on overlooked or misunderstood sources. For instance, when the senator Cato the Elder states that women were excluded from a sacrifice honouring Mars Silvanus, he clearly underlines how this exclusion was related to this specific ritual (De Agricultura 83 – an ancient text about farming, old custom and superstition). This emphasizes how women’s participation in sacrifices was the rule rather than the exception. Indeed, women were allowed to perform sacrifices in a wide-range of places and under various conditions. 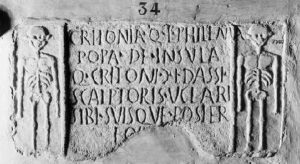 First of all, some priestesses such as the Vestal Virgins performed sacrifices pro populo, ‘on behalf of the people’ (Ovid, Fasti 5.621). However, they were not the only ones enjoying this privilege. The Roman historian Livy tells us that matronae (mothers) offered a sacrifice to Juno Regina in 207 BC without the help of a priest (27.37.8-10). Thirdly, women could be allowed to take part in sacrifices supervised by men, as was the case during the Terminalia or the Fordicidia (Ovid, Fasti 2.645-54 and 4.629-40). These were religious festivals sponsored by the state, and usually recurred every year in order to renew peace with the gods and maintain their divine protection. Even if they were not sacrificing, women were also included in the ritual scene through varied roles: the ‘simpulatrices’ were women using a simpulum (small ladle) to pour water, honey or wine. Libations were an important religious act that usually preceded the slaughtering of the victim(s). Finally, young girls of noble birth, the camillae, could serve the priestesses during certain sacrifices. Consequently, we cannot claim that the religious roles of Roman women, priestesses or not, were private and marginal. 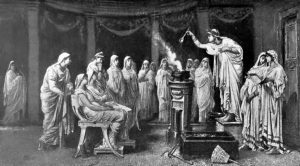 Presiding over sacrifices was a symbol of one’s authority within society and the participation of women in public sacrifices was connected to their status and prestige. Sacrifices in the ancient world were divided into two sections: blood and non-blood ones. Researchers usually understand animal sacrifices as highlighting social order in the world – a world were women apparently had a subordinate role. 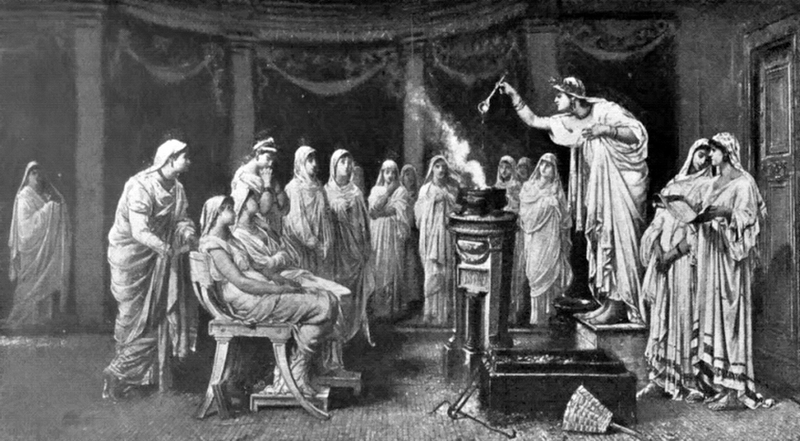 Despite the lack of literary and archaeological evidence, it appears undeniable that most priestesses were allowed to supervise blood sacrifices (Cicero, De Haruspicum Responsis 12.37 ; Macrobius, Saturnalia 1.15.19 and 1.16.30). Furthermore, most of these ceremonies were organised in highly significant places for the Romans. For instance, the Flaminica Dialis (priestess of Jupiter) was supervising, frequently and independently, animal sacrifices in the Regia. The Regia was one of Rome’s oldest buildings, located on the Roman Forum and where religious officials were holding their meetings and ceremonies. The presence of these priestesses in such important locations, illustrates how they were fully vested with sufficient privileges and authority to sacrifice. However, Roman priests and priestesses were never in charge of the killing of the animals. It was the responsibility of their assistants, either called popae (attendant at a sacrifice) or victimarii (sacrificer). 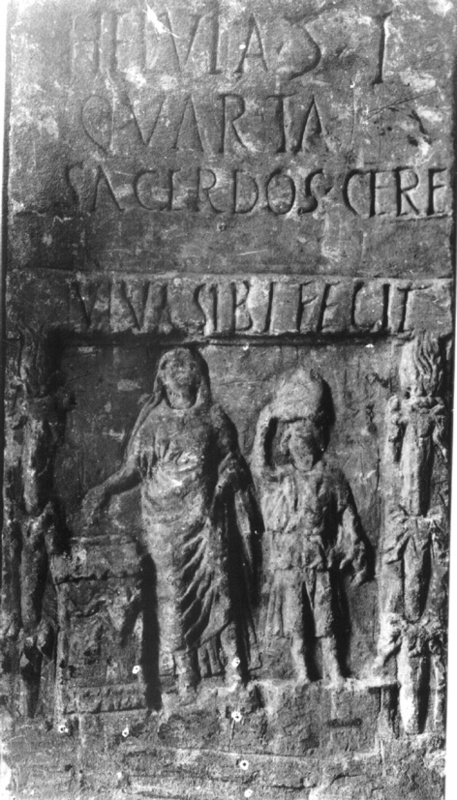 Roman visual representations of sacrificial slaughterers seem to point out that the profession was only opened to men. Yet, these evidence do not represent non-state-sponsored sacrifices. And as pertinently underlined by Professor James Rives, the absence of evidence is not evidence of absence (2013, 144). 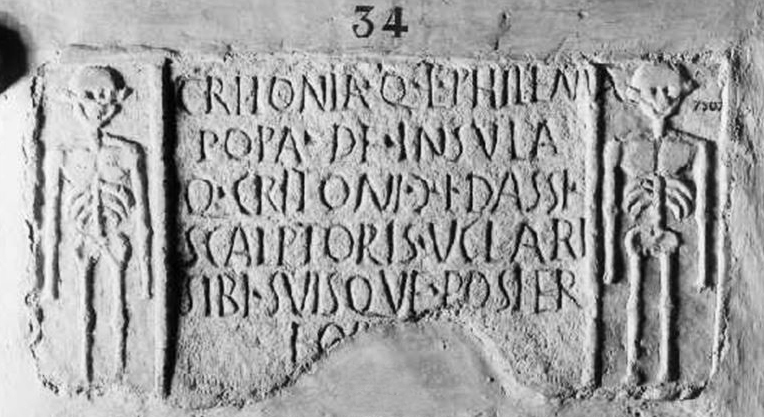 Our most interesting and surprising clue regarding this matter is given by a Roman funerary inscription from the imperial period about a freedwoman, Critonia Philema, who is presenting herself as a popa de insula (sacrificer of the apartment house?). Critonia Q(uinti) l(iberta) Philema / popa de insula / Q(uinti) Critoni | (muliebris) l(iberti) Dassi / scalptoris uclari(i) / sibi suisque poster(isque) / eor(um). Researchers do not agree whether she was actually a sacrificial slaughterer, or if she was a keeper of sacrificial animals. Nevertheless, the meanings of Latin words do not usually change based on the gender of the individuals they are applied to. Conclusively, our sources show that women were entitled to be involved in blood sacrifices, even if they were maybe only supervising the rituals. However, Rome might have had victimariae (female sacrificial slaughterers) who were sharing their knowledge with other women. 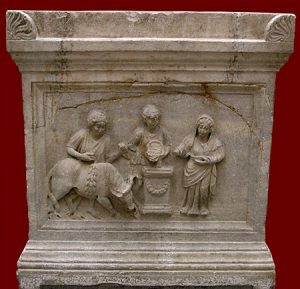 For instance, during the festival of December honouring the goddess Bona Dea, a ceremony famously known for excluding men, the Vestal Virgins were in charge of sacrificing a sow (Cicero, De Haruspicum Responsis 12.37 ; Macrobius, Saturnalia 1.12.20-3.). Consequently, one or several women may have acted as ‘sacrificial slaughterers’ as men were banned from the event. Figure 5: ‘The Vestal Virgins’, after a painting by H. le Roux. To conclude, there is absolutely no reason to deny women’s sacrificial capacity as well as their religious authority. They were fully permitted to contribute to the safety and well-being of the Roman community by performing sacrifices, even blood ones, with or without any supervision. de Cazanove, Olivier. “Exesto: L’incapacité sacrificielle des femmes à Rome,” Phoenix 41 (1987) : 159-174. Flemming, Rebecca. “Festus and the role of women in Roman religion,” in Verrius, Festus and Paul: Lexicography. Scholarship, and Society (Bulletin of the Institute of Classical Studies Supplement 93), edited by Fay Glinister et al. London: University of London Institute of Classical Studies, 2007. Hemelrijk, Emily. “Women and Sacrifice in the Roman Empire,” in Ritual Dynamics and Religious Change in the Roman Empire, edited by Olivier Hekster, Sebastian Schmidt-Hofner and Christian Witschel. Proceedings of the Eighth Workshop of the International Network Impact of Empire (Heidelberg, Julia 5-7, 2007). Leiden and Boston: Brill, 2009. Richlin, Amy. Arguments with Silence. Writing the History of Roman Women. Ann Arbor, MI: University of Michigan Press, 2014. Rives, James. “Women and animal sacrifice in public life,” in Women and the Roman city in the Latin West, edited by Emily Hemelrijk and Greg Woolf. Leiden: Brill, 2013. Scheid, John. 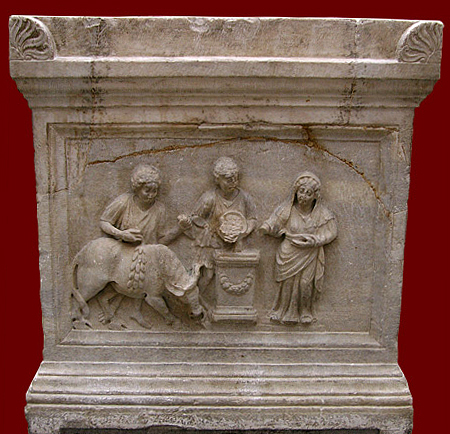 “Roman animal sacrifice and the system of being,” in Greek and Roman animal Sacrifice. Ancient Victims, Modern Observers, edited by Christopher A. Faraone and F. S. Naiden. Cambridge: Cambridge University Press, 2012. Schultz, Celia. Women Religious Activity in the Roman Republic. Chapel Hill: University of North Carolina Press, 2006. Takacs, Sarolta. 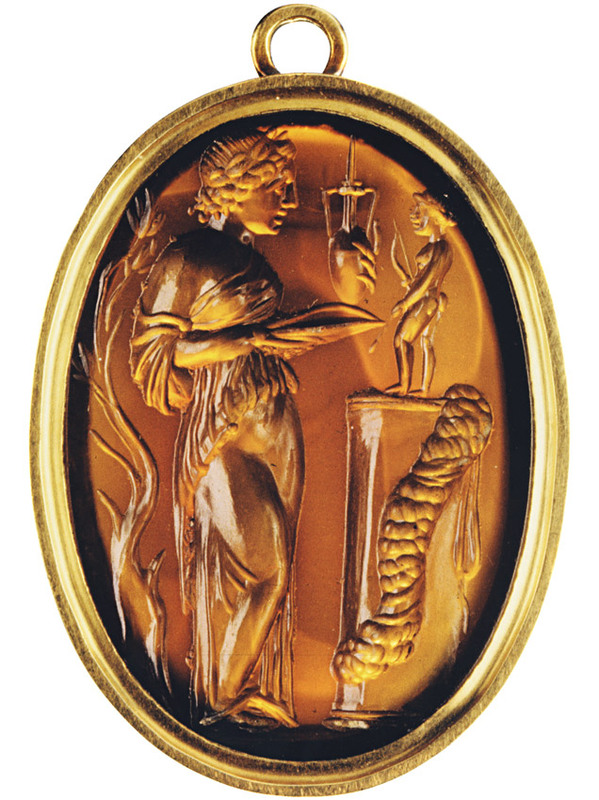 Vestal Virgins, Sibyls, and Matrons: Women in Roman Religion. Austin: University of Texas Press, 2008. Versnel, Henk. “The Festival for Bona Dea and the Thesmophoria,” Greece & Rome 39/1 (1992): 31-55.